If you only do one thing on your bucket list for your trip to Japan in 2018, It must be this. In 2018 You Must-- Go to TSUKIJI fish market before it moves! Click To Tweet The Market will move on October 5th 20018 and the internet is full of reasons why, good information on how to go. I will share some of the best tips, resources and information here. No. 1 – The Auction? Should you go? And if yes, what do you need to know? Only 120 people can see the auction each day. You will need to line up around 3:30 am if you want to secure a spot and this is likely to get harder and earlier as we get close to the last day of the market before the big move. You cannot bring food or drinks in the waiting area and the market staff have set other limits to what can and cannot be done . Overall I highly recommend doing your research before trying to see the auction. No. 2 – Tsukiji is amazing without the auction and by the way, there are actually 4 markets at Tsukiji! The markets and neighborhood around Tsukiji are among my favorite places in Tokyo. Visiting stalls, having the freshest sushi in the world, browsing terrific kitchen tools, finding the perfect handmade sushi chef’s knife, eating mochi, drinking green tea– the area has no end of experiences to enjoy. 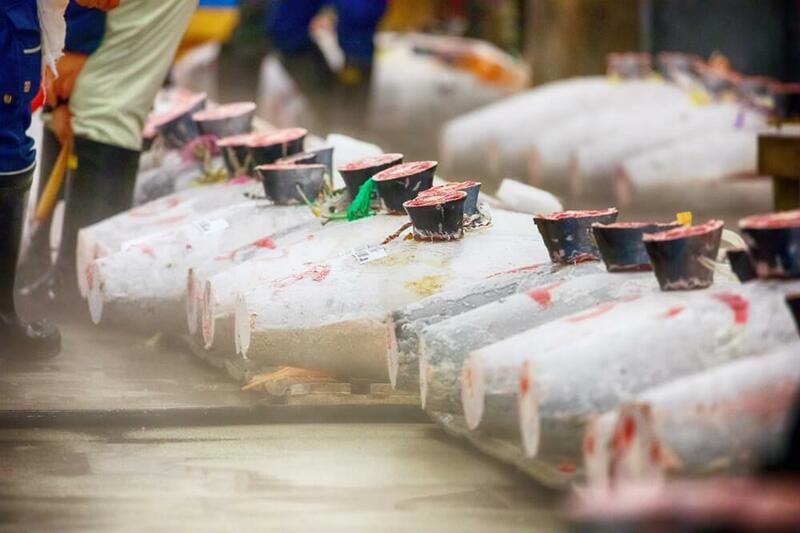 In fact Tsukiji is not just one market, but four interdependent markets with different specialties and culture. Tsukiji Market (the wholesale market) otherwise known as the “Inner Market”, is a part of the Japan Central market system of 52 markets around the country, and actually unknown to many visitors, there are TWO markets inside the inner market area. The fish market is the more famous, and the largest of it’s kind in the world, but inside the market grounds you will also find a huge produce market. Want to see what is seasonal in Japan? Want to check out all the different veggies unique to Japanese cuisine? Take a wander around the produce market. Compared to the gruff, fast and furious, no-nonsense vibe of the wholesale fish market– the produce area is rather laid back, almost zen. NOTE: You cannot visit the inner markets before 10am as the early morning hours are reserved for the wholesale business that is the main focus of this area. You can, however, eat at one of the many famous and not so famous local restaurants serving sashimi, noodles, grilled fish, sushi and other local dishes while you wait for the 10am “open to visitors” start time. The new mixed purpose market buildings are toward the end of the street entering the market area. Two salmon-pink buildings connected by an overhead pedestrain walk way, these 3 story buildings are a must see. This market was added to support the area and keep the Tsukiji brand thriving after the main fish and produce markets relocate to Toyosu. On the first floor you can browse some 65 vendor stalls. These vendors were chosen from applications from the inner market companies who did NOT want to relocate to the new market. This mini market has a lot of the same look and feel (though new and fancy) of the inner market. Mostly fish stalls, but you can also find fruit and veggies, gifts, and even a new cold press juice stand. The second floor is for trade only, containing meeting rooms, offices and support services for the professionals at the market, and the third floor in both buildings provide a place for shoppers to eat some of their purchases, buy lunch at a few restaurants, take a break during the market visit, or just view the area from above. Finally the vibrant, crowded, Outer Market is a warren of small streets lined with retail shops, sushi restaurants, vendors and tasting stands mostly run by families who have been in the area long before the Tsukiji Inner market moved here some 80 years ago! This area is a ton of fun and if you are a foodie, leave lots of time in your schedule to browse, taste, people watch and shop. I have a few favorite places here, a great pottery shop, a wonderful green tea and seaweed store, and one of the BEST knife shops in Tokyo. The outermarket is a wonderful place for locals and tourists alike. No. 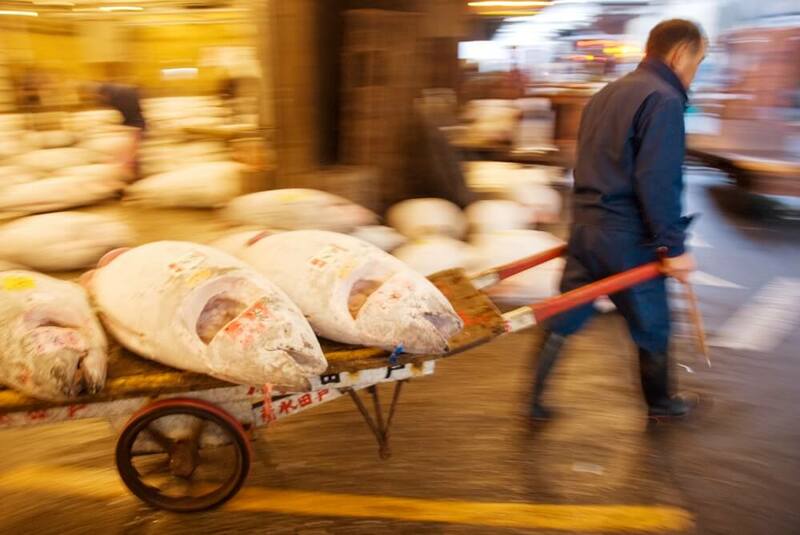 3 – The best way to get the most out of your visit to Tsukiji is with a passionate, local guide! You can easily go to Tsukiji on your own. It will be fun. 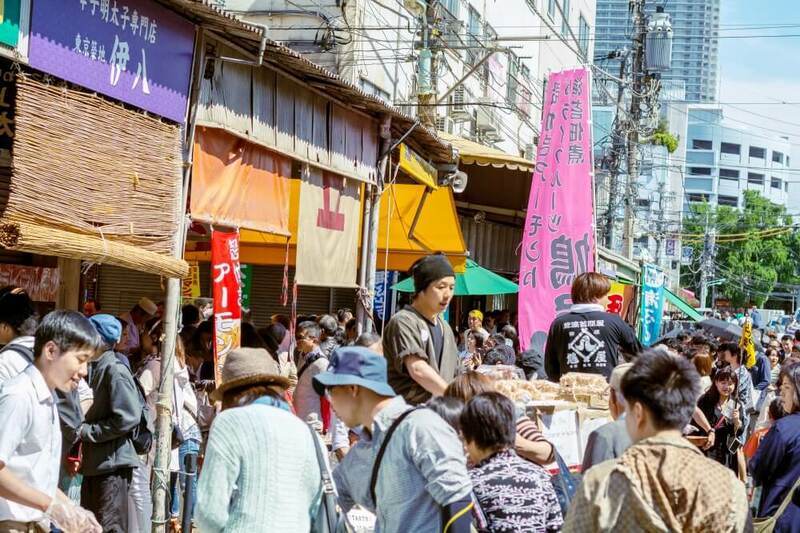 BUT… you will have so many questions, so many things will be new and interesting, the market has such a fascinating history, and things change so much from season to season that a great tour with a Tokyo local who loves the market will make the experience SO MUCH BETTER! 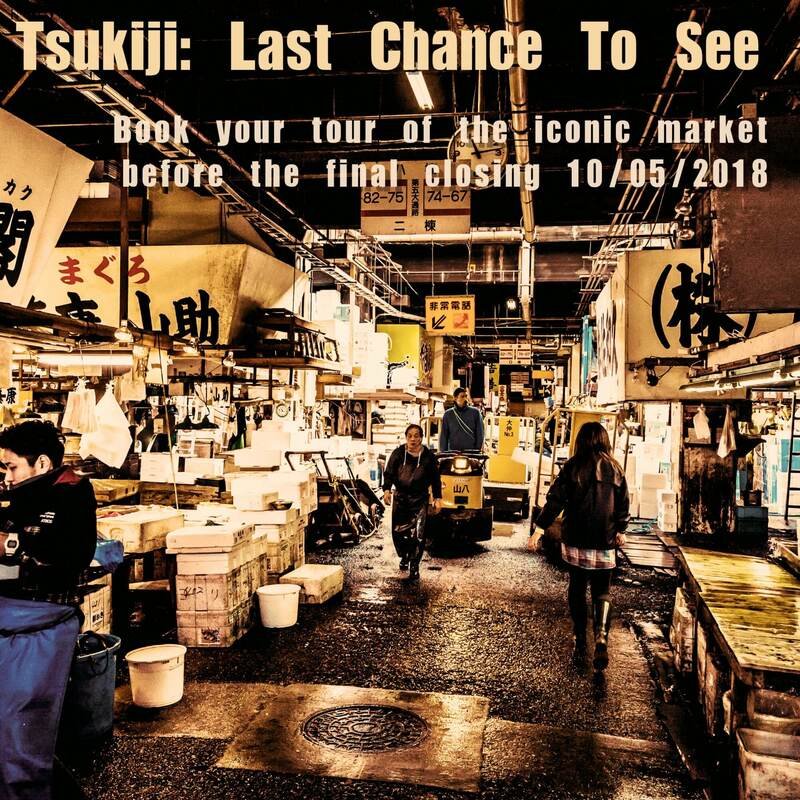 Of course, I am biased and I helped create the tour at Arigato Japan so my recommendation is to try our highly rated 3 hour Tsukiji Breakfast Tour. If you find another tour that seems to fit your style better, that is totally great too. Just make sure to book a guide for this amazing place. You will enjoy it 100x more. I cannot overstate the difference taking a tour can make. In fact I am so sure about this that if you would like to book our tour, and you have read this far, use this code “tsukijistory2018” in our booking form and save 10% on your tour! Tsukiji can be super fun for families BUT the market is a busy place, Strollers are impossible and are banned in the inner market. Come hungry, you can try so many unique things here. The inner market is closed most Wednesdays, all Sundays and some other special holidays. Most of the prices in the outer market are reasonable, because chefs and locals also shop here the prices are not too elevated for tourists. The inner market is a working wholesale market, tourists are in the way, so do your best to be respectful, move out of the way, and keep a low profile. Some spots do not want you to take photos and there are signs posted, please respect the rules. Plan to spend a half day here for sure to get the most out of your visit. Try something new, push your boundaries here and try a unique type of fish, or experience. If not now? When? Many outer market vendors speak some English but the market is busy so please be patient. Finally a little special hint, because I am a coffee fanatic– Be sure to visit Turret Coffee which has some of the BEST coffee in the city. Bloomberg has a pretty definitive though basic article here. Want to understand why, when and how the inner market is moving? Read this. The official Tsukiji Outer Market page has a lot of great info, history and store information about the area. Even after a tour you will want to wander and explore a bit more in the outer market. This handy downloadable PDF map and info can really help you find and remember the spots you want to visit. The historic inner market will move from October 5th 2018. Don’t miss out — Book Your Tour! (many tours will sell out for March, April and May during the busy Sakura Season so don’t delay) Remember the special code above. See you at the Market!